Is This an Early Spring? If I’ve heard it once, I’ve heard it a hundred times in the last couple of months – “This is really an early spring!” By “early spring” most folks are referring to a year when leaves and flowers appear earlier than “normal.” The conversation quickly moves to “How early?” and this is where some data would be handy. Welcome to phenology! Phenology primarily deals with the relationship between climate and the timing of biological phenomena like flowering in plants or bird migration. 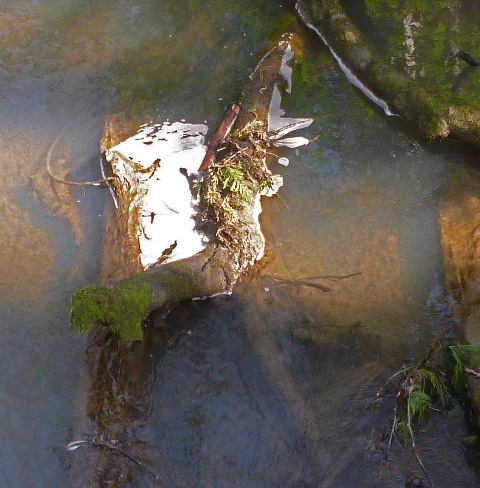 The starting point of phenology is creating long-term records of when certain biological events occur. Using these records, one can then make statements about “early springs,” “late autumns,” and other periodic climate-related events. 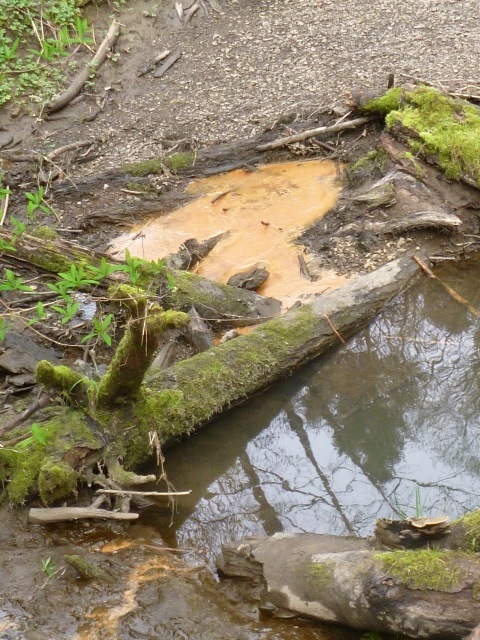 I started keeping phenological records for Tryon Creek State Natural Area (TCSNA) in mid-spring of 2013. Since then I’ve made observations every 7 to 10 days on about 70 specific, individually tagged plants. 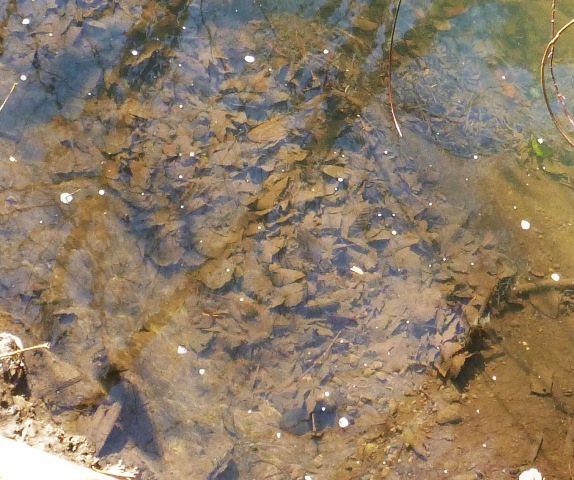 Since the Tryon Creek Phenology study is new, the question I’m really answering is “Was 2015 an early spring compared to 2014?” After studying the records for the study plants, I found there are really three answers. Answer #1: Yes, it was an early spring! 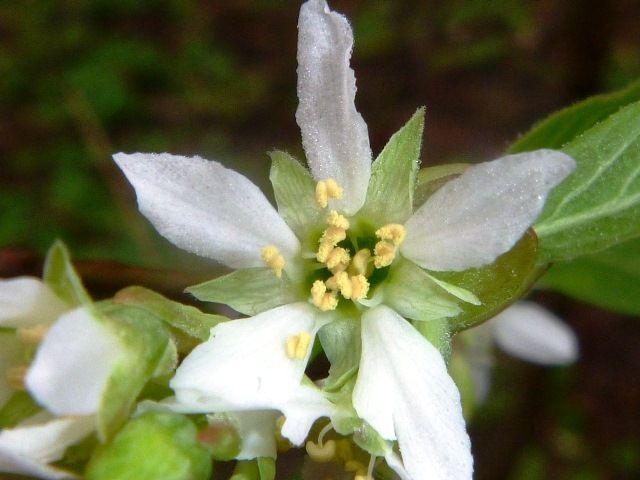 Based on 8 Indian plum (Oemleria cerasiformis) plants that produced flowers both years, in 2014, the average date for the opening of the first flower was March 10th. The average date for opening of the first flower in 2015 was February 18th, a difference of 20 days! For the flowering of Indian plum, 2015 was an “early spring” for sure. Vegetative bud break in red elderberry (Sambucus racemosa var. racemosa) was also earlier this year. Based on 3 plants, the average date of leaf emergence in 2014 was February 23rd, while this year it was February 14th, a difference of 9 days. 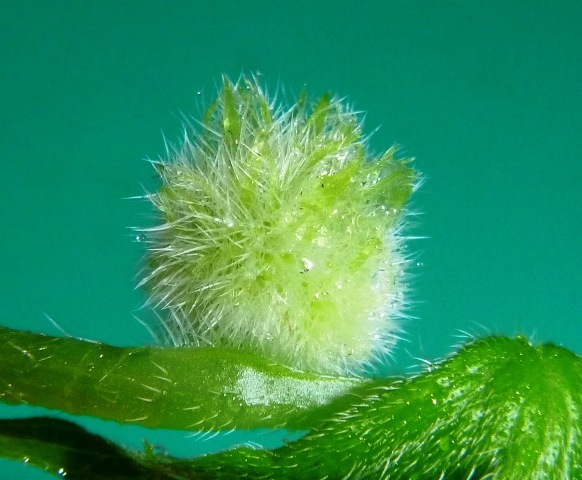 Finally, four Pacific waterleaf (Hydrophyllum tenuipes) plants produced visible flower buds on March 29, 2014, but this year, they all produced flower buds 11 days earlier, on March 18th. Answer #2: It was a normal spring! Looking at the date of bud break of 10 Indian plum plants, a different story emerges. In 2014 the average date when leaf tissue extended beyond the bud scales (as seen in the photo below) was February 4th. This year, that date was February 1st, just three days earlier. 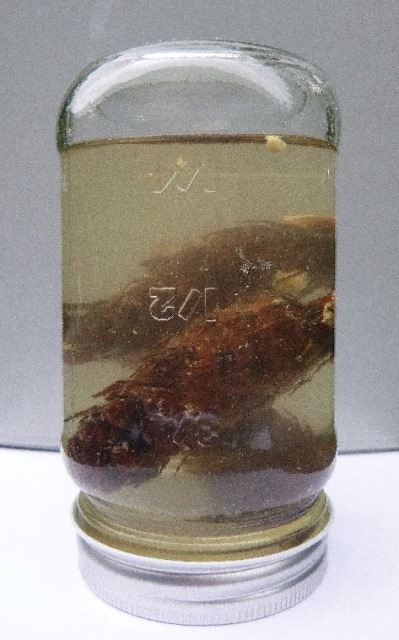 This is approximately the amount of experimental error one might expect in this study. In other words, this difference might be real or it might be a consequence of the length of time between measurements. The particular vine maples (Acer circinatum) I monitored, rarely produced flowers, so I had to rely solely on the date of first bud break. I checked the date when the leaf tissue extended just 2 to 3 mm (about 2/10ths of an inch) beyond the red bud scales. 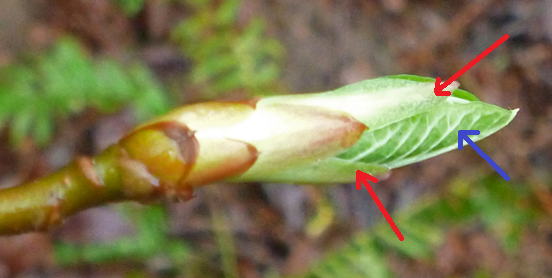 In the picture below is a vine maple bud that is at this stage. The leaf tissue at this point has a whitish, hairy appearance. On average, the six plants that were examined in both 2014 and 2015 reached this stage on March 23rd in 2014, and March 21st in 2015. This is a difference of just 2 days. In this study, that is within experimental error of being identical. 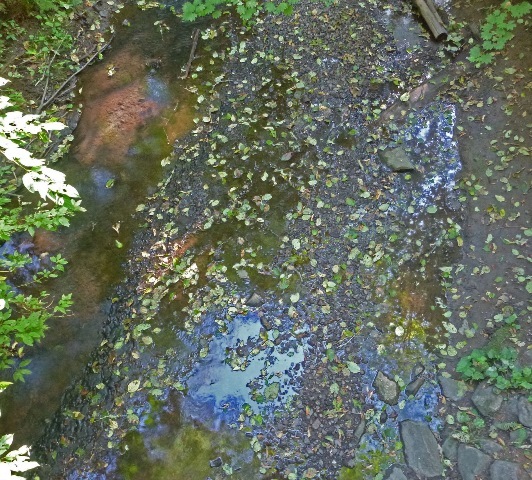 So at least for vine maple, there was no difference in time of bud break between the two years. Answer #3: It was a late spring! Some of the plants seemed to be a little later this year than last. 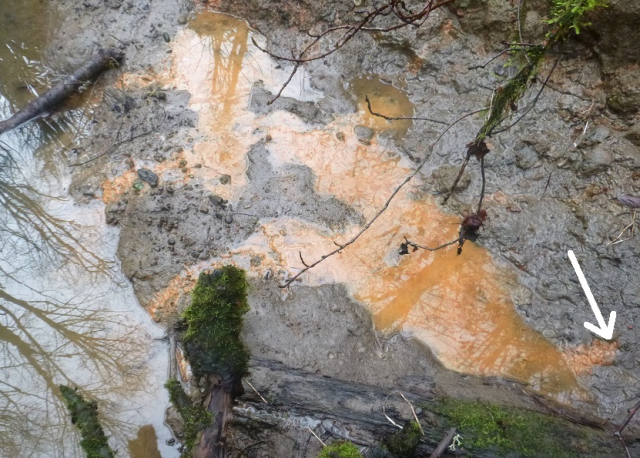 For example, based on 4 salmonberry (Rubus spectabilis) bushes, in 2014 the leaves first extended beyond the bud scales on February 11th. This year, they were a week later, with the leaves not extending beyond the bud scales until an average of February 18th. Early, Normal & Late? What’s the deal? For the vegetative and flower buds of native plants in temperate regions to open up (“break”) and begin growing, two things need to happen. First they need to experience cold (termed “chilling”), and second, they need to experience warmth (termed “forcing”). In that order! Why do the plants do this? While the buds of most plants are pretty tough, the young shoots are relatively delicate. So the plant faces two challenges in the timing of bud break. Challenge #1: The plant doesn’t want the buds to break too early and start growing just before a big freeze hits. The plant “knows” that even after a short warm spell in December, it could turn fatally cold in January. Challenge #2: The plant doesn’t want to start growing too late in the year, like mid-July! Starting growth too late means it would miss out on some really nice growing weather in late spring and early summer. 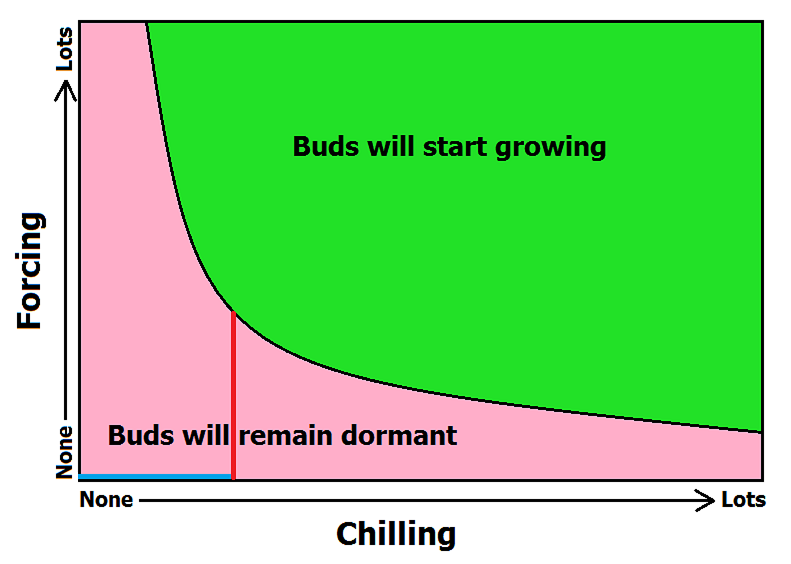 “Forcing” is the amount of warmth a plant receives prior to bud break. Typically, any temperature over 50° F counts as forcing. Anytime the temperature is over 50° for an entire hour, the plant is credited with 1 forcing-hour. 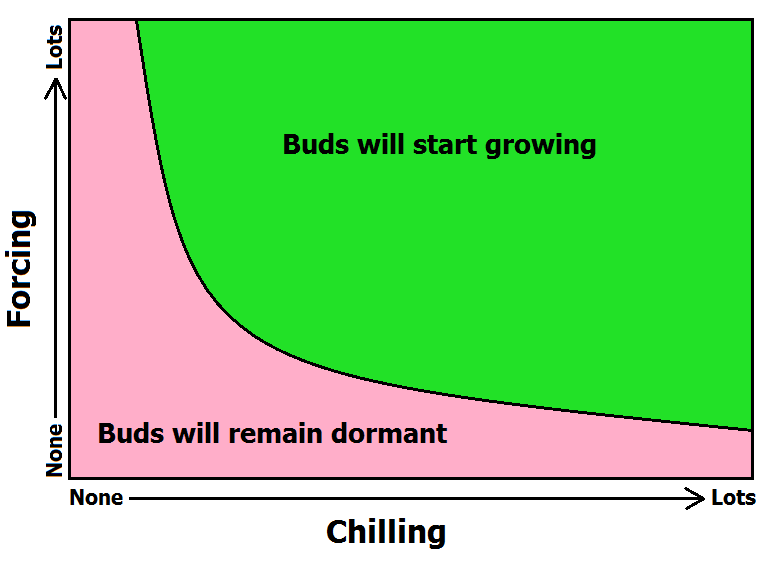 The diagram below shows the basic relationship between “chilling,” “forcing,” and bud break. 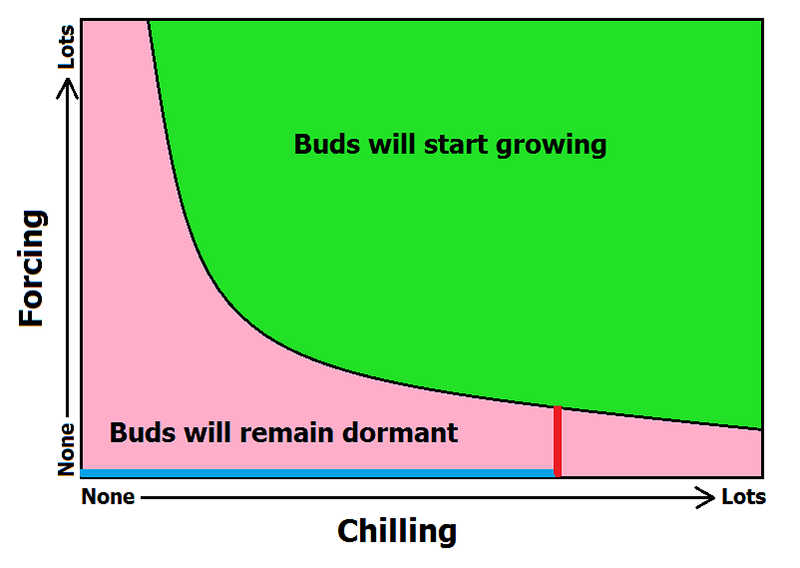 The black curve between the pink and green areas represents the combined amount of chilling and forcing that are needed before a plant can start to grow. 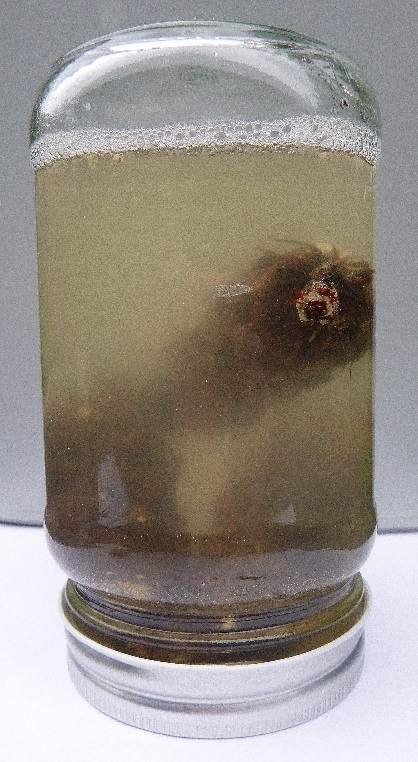 The general rule is that the more chilling a plant gets, the less forcing it needs to bud break. Different species of plants have chilling/forcing curves with different shapes. Give yourself bonus points if you noticed that when a temperate region plant receives no chilling, there can never be enough forcing to cause the buds to break! The diagram below represents a plant after a fairly cold winter. The blue line at the bottom of the chart shows how much chilling this example plant received. 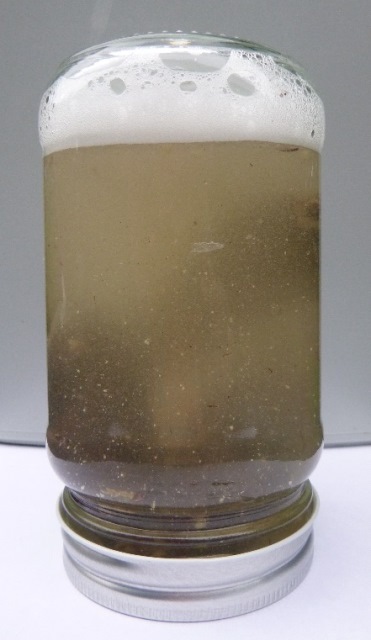 The red vertical line shows how much “forcing” it requires to start growing. In this diagram, the winter has been fairly cold. Therefore very little forcing is needed to allow bud break. This diagram represents what happens in a fairly warm winter. Once again, the blue line represents the amount of chilling a plant received, and the red line represents the amount of forcing the plant needs for bud break. By comparing the two diagrams, you can see that with less chilling, the plant needs more forcing to achieve bud break. The differences observed in my study may have come about in several ways. One attractive explanation is this: A “warm winter” easily satisfies the chilling needs of those plants with a low chilling requirement, but not those with a high chilling requirement. Once it starts to warm up in the late winter, the plants with a low chilling requirement would only need a small amount of forcing prior to bud break. Plants with high chilling requirements would not have had all the chilling they really “wanted” and thus would have needed extra-large amounts of forcing prior to bud break. Thus these plants would have delayed bud break and blooming. So the real answer is that 2015 compared to 2014 was an early spring, a normal spring and a late spring, depending upon what plants you were watching. Sometimes that’s the most we can hope for!